"Bougainvillea" doubles as a botanical name (genus name) in plant taxonomy and as a common name. When using it as a common name, I do not capitalize. Botanically, the plants are classified as woody vines, although they often behave more like shrubs. In fact, they can easily be trained to grow as shrubs (see below). The foliage of these tropical flowers is usually evergreen in warm climates, but their leaves will sometimes drop if watering has been insufficient. These vines can attain a height and spread of 15-40 feet and contain thorns. What appears to be the flower on bougainvillea plants is actually a foliar structure referred to as a "bract." The flower, technically, is much smaller and not nearly as eye-catching (it is off-white to yellow in color). Poinsettias, another tropical, similarly depend on bracts for their appeal. The bracts come in colors of red, pink, purple and yellow. The leaves of some varieties are variegated (see photo). Indigenous to South America, bougainvillea vines grow best in USDA planting zones 9-11. Vines will often blossom most profusely if grown in full sun; however, they will tolerate light shade (and may even crave it in especially hot climates). Grow them in a well-drained soil. They will perform better in a soil with plenty of humus and a soil pH that is acidic. Bougainvillea vines are often seen growing against walls (in foundation beds, for example) in hot climates, such as in the Mediterranean, in the Caribbean, or in Southern California. However, these vines often need help in climbing, so provide a trellis or train them via espalier. In fact, if unsupported, they may just sprawl across the ground in some cases and function as a groundcover. If you wish to treat them as shrubs, prune them to keep them compact and do not provide them with anything to climb up. Some like the look of bougainvillea growing in containers around pools (they do create that desirable Mediterranean villa look), but their thorns make them less than ideal plants to grow around swimming pools (in heavily trafficked areas, at least). Those who live in cold climates may treat the vines as annuals or bring them indoors during the cold weather and keep them as houseplants until summer returns. Make sure you do not overwater them if you are growing them indoors for the winter. I live in zone 5 and have seen them for sale here in hanging baskets (a backyard fence festooned on the inside with such hanging baskets could suggest a Mediterranean look, with a little help). The usual recommendation for fertilizing is every other week (during the summer). Specialized fertilizers for them exist that go by names such as "Bougain," but I simply apply a balanced fertilizer. 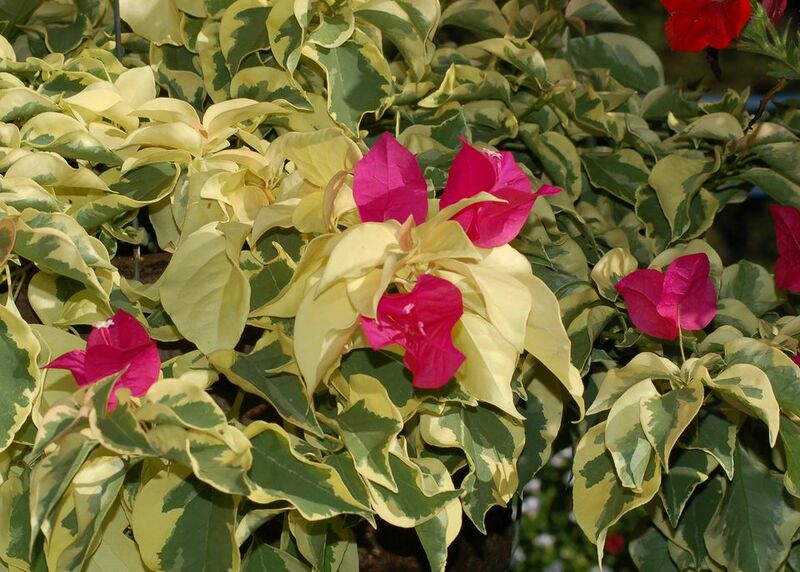 Although relatively a drought-resistant plants, bougainvillea vines will perform better if watered sufficiently, especially in terms of blooming. Prune the vines after they have finished blooming. Do not spare the pruners and spoil these aggressive vines: they enjoy a good pruning. Annual tip pruning will keep them more compact. The latter are sometimes referred to by the common name, "paper flowers." The name derives from Louis Antoine de Bougainville (1729-1811), a French navigator. A botanist sailing with Bougainville discovered bougainvillea plants when their ship put in along the coast of Brazil. I suppose the name of his superior officer was deemed as good a name as any by which to call the vine. When confusion exists over how to pronounce the scientific names of plants, we can usually take refuge in the spiffier common names. Such is not the case, however, with "bougainvillea," where, as mentioned above, the botanical name doubles as a common name.